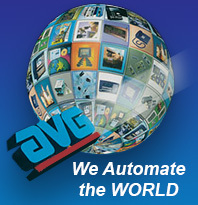 Connect to over 90% of Installed PLCs and Networks anywhere in the World! 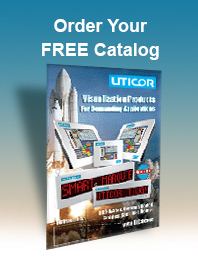 The Uticor HMI Touchpanels communicate to more PLCs and Networks than any other HMI. Allen-Bradley panels talk to mostly AB PLCs, Siemens panels talk to their PLCs, Mitsubishi HMIs communicate mostly to their PLCs and so on. 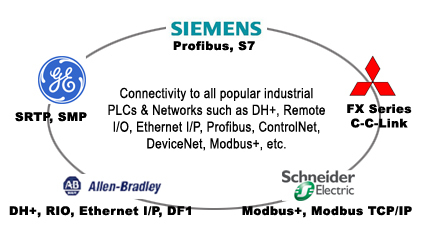 A vast majority of North American Plants still have AB's Data Highway Plus (DH+) or Remote I/O (RIO) networks in place. No other Touchpanel HMI manufacturer other than Uticor, EZAutomation and Allen-Bradley can communicate over Data Highway Plus (DH+) or Remote I/O. This is a great feature for OEMs and System Integrators to consider, when selecting a Touchpanel HMI to be their standard HMI.